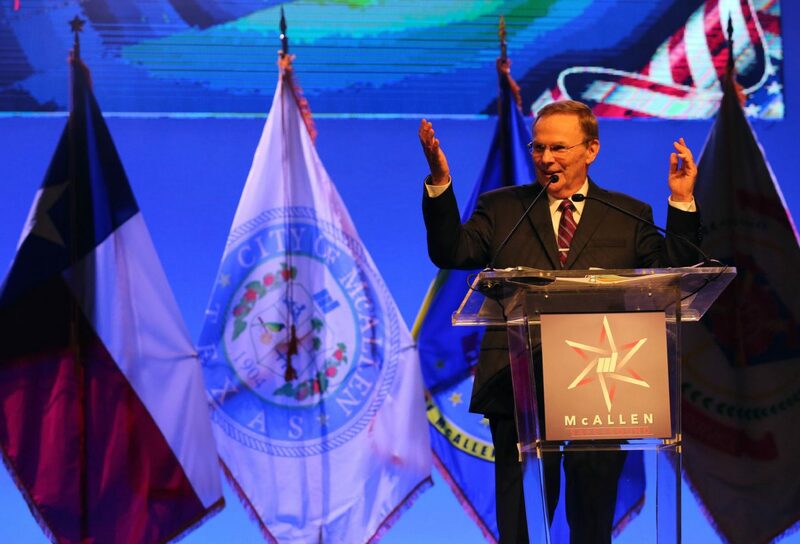 City of McAllen Mayor Jim Darling gives his State of the City address Tuesday, February 6, 2018, at the McAllen Convention Center. McALLEN — Following Hidalgo County’s lead, city commissioners here voted to oppose the federal government’s decision to place a citizenship question in the 2020 U.S. Census. McAllen officials said including the question would result in an undercount of the population. The Mission city council also voted to oppose the citizenship question. This city’s resolution spearheaded by Mayor Jim Darling and approved by five of the six city commissioners pits McAllen against the state’s top leaders, including U.S. Sen. Ted Cruz, Gov. Greg Abbott and Attorney General Ken Paxton. Cruz, Abbott and Paxton support the federal government’s decision in March to include a question in the 2020 U.S. Census that asks people if they are a U.S. citizen. Darling and five commissioners voted in favor of opposing the question. District 2 Commissioner Joaquin “J.J.” Zamora abstained from the vote. While Hidalgo County voted to join a lawsuit opposing the citizenship question, McAllen simply voted to voice its opposition to including the question, not join any legal proceedings. “My understanding is that a majority of the people here illegally came over legally, and overstayed their visas, etc. etc.,” Darling said at Monday night’s commission meeting. “And so, the federal government is supposed to enforce immigration policy and hasn’t done that,” and many of these people now have children here. Quintanilla added that he felt “a little uncomfortable going one way or another on this resolution.” However, he was comfortable enough to vote in favor of the resolution. Recently elected District 1 Commissioner Javier Villalobos countered Quintanilla’s point.